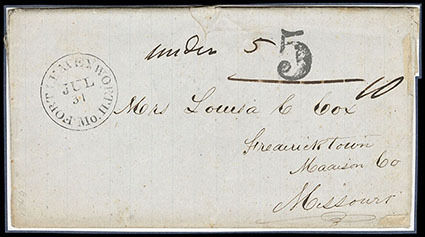 (Unorganized Missouri Territory) "Cant Leavenworth Mo., June 16th", manuscript postmark with matching "25" rating on folded cover to Major L. Taliafero, U.S. Indian Agent, St. Peters, Upper Mississippi, inside "9th August 1829" receipt docketing, endorsement on flap "If Majr Taliafero is absent from here Mr. Elias. T. Langham will open this letter and oblige & c"; opening tear at right, Very Fine, ex-Alexander. 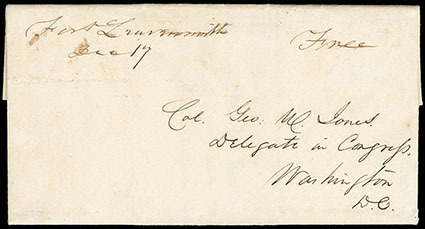 THE EARLIEST RECORDED CANTONMENT LEAVENWORTH POSTMARK. Early in the year 1827, the War Department ordered Col. Henry Leavenworth to follow the Missouri River until he reached the mouth of the Little Platte River, and established a permanent military cantonment on the east bank of the river. Col. Leavenworth explored the area, and determined that the west side (ultimately the Kansas) side of the river was the best site for the construction of the cantonment. Due to its strategic location on what was to become the Oregon Trail, Fort Leavenworth became a key supply station on the westbound route settlers took on their long journey to California, Oregon and Utah. 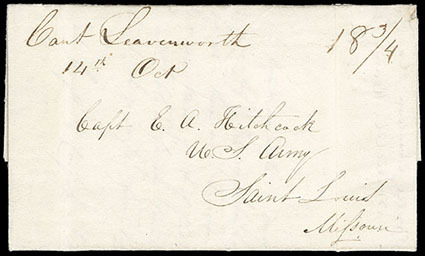 (Unorganized Missouri Territory) "Cant Leavenworth, 14th Oct", manuscript postmark with matching "18¾" rating on Oct. 14th 1837 folded letter from Col. Stephen Watts Kearny to Capt. Ethan Allen Hitchcock at Jefferson Barracks, interesting letter concerning the relocation of Fort Gibson and recruitment of Indians Kansas to help fight the Seminoles in Florida: "…letter from Genl. Macomb saying that they are appointed by the War. Dept. Commissioners to select a site for a new Post, to remove the troops from Gibson…The 180 Indians, who left this neighborhood for the Florida war are not missed by us. There were however amongst them, some of the very best Warriors we know of, and if properly managed may be made serviceable. I blush for my Country when I think of the invitation they received, to go so far from their Home, to fight our battles." and signed "S.W. Kearny", Very Fine. (Unorganized Missouri Territory) "Cant. 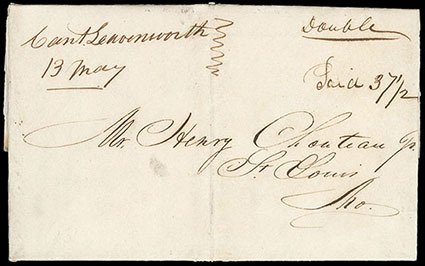 Leavenworth, 13 May", manuscript postmark and matching "Paid 37½" cent due rating on 1831 folded letter to St. Louis Mo., letter enclosed a draft for $34.33 on Messrs John Smith & Brother, payable to your order "…This is to meet a demand on Lt. Warfield for the hire of Capt. Smith's slave Horace, upon Lt. W's leaving Jeff. Barracks, Horace continued with me, and I took the payment for him on myself. Some Short time afterward I called on you, and requested you to present the bill to Mr. Geo. Kennerly, and he would pay it. - Presuming this had been the case, I gave myself no further concern, until from a letter from Lt. Warfield I learnt that it had not been paid. I regret very much that accident should have caused so long a delay" and signed "J.Freeman, Lt 6th Infy", Very Fine, ex-Beals. (Unorganized Missouri Territory) "Fort Leavenworth, Dec 17", manuscript postmark and matching "Free" rating on 1835 folded letter to Territorial Delegate Col. George W. Jones at Washington D.C., Very Fine and choice. 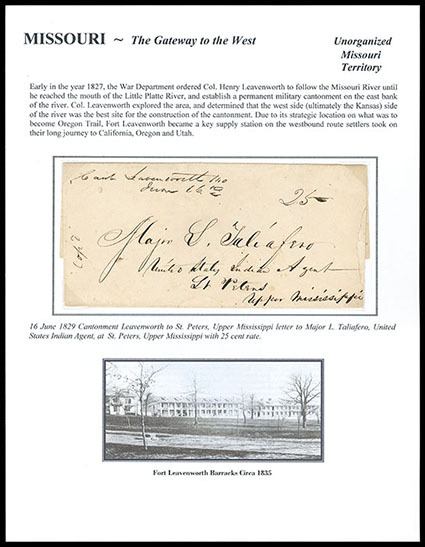 ONE OF ONLY TWO RECORDED "FORT LEAVENWORTH" POSTMARKED USAGES IN PRIVATE HANDS PRIOR TO THE POST OFFICE NAME CHANGE IN 1839. Cantonment Leavenworth was redesignated "Fort Leavenworth" on February 8th 1832 by War Department General Order No. 11; however, the Post Office Department continued the use of the word "Cantonment" until 1839. Consequently, the postmaster was technically required to continue the use of the word "Cantonment" until the POD rule was changed. However, in late 1835 the postmaster at Fort Leavenworth used the Army designation "Fort" in his townmark rather than the Post Office Department "Cantonment." Six examples used that year are known, but only two of these are in private hands. This is one of those two examples, dated December 17th 1835, carried to Washington under the free frank of the Iowa Territorial delegate to Congress, to whom it is addressed. (Unorganized Missouri Territory) "Fort Scott Mo., March 30 -", manuscript postmark ties 3¢ dull red (11A), pre-use tear, on blue 1853 folded letter to New York City, the letter is from a sergeant at the fort and he is asking that newspapers be sent to him there, he is obviously unaware that the garrison will be moved within a month; fold mends, Fine, ex-Alexander. ONE OF ONLY FOUR RECORDED USES FROM FORT SCOTT DURING THE UNORGANIZED TERRITORY TIME PERIOD, THIS BEING THE ONLY STAMPED USE. Fort Scott was established on May 30, 1842, and built along the Military Road four miles west of the Missouri state line in what is now Kansas. This was considered the Permanent Indian Frontier at the time. It served as an intermediate post on the military road that connected the frontier forts from Fort Snelling in the North to Fort Jessup (Louisiana) in the South. The main duty was enforcing peace between the Osage Indians and settlers on their way west. The post was abandoned on April 22, 1853, but was re-occupied by troops during the Civil War in March 1862. 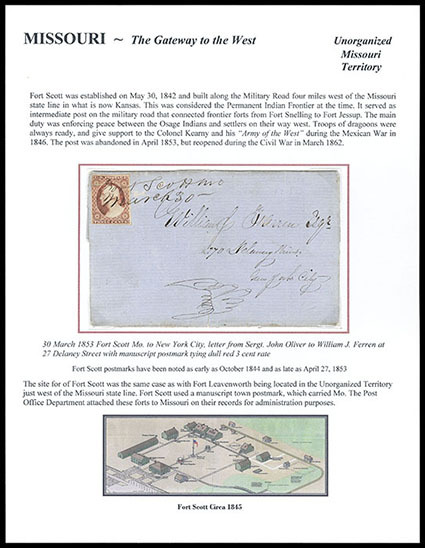 As was the case with Fort Leavenworth that was also in unorganized territory west of the Missouri state line, Fort Scott used a town mark (manuscript) incorporating the term "Mo." The Post Office Department attached these forts to Missouri on their records for administrative purposes. (Unorganized Territory West of Mo., now Wyoming) "Fort Laramie, June the 15th 1849", dateline on gray folded letter from Henry A. Cox to his wife at Fredericktown Mo., carried by military express to Fort Leavenworth, entered mails with "Fort Leavenworth Mo. Jul 31" cds and matching large "5" rating handstamp, upon arrival correctly rated "Under 5" and totaled to "10" cents due for over 300 miles, this was the writer's second letter home since starting on the California trail, "…the very next morning (Sunday morning) about the Break of day as the last Guard came in from herding the cattle they came running into Camp hallowing Buffalo Boys Boys Buffalo-every man, woman and child on the ground was out in less than two minutes and every horseman had his guns pistols and horses in a state of readiness for a chase in less than two. We all set out under considerable excitement each man declaring he would have a Buffalo Scalp before night. About 11 O'clock we all returned when Lo and behold we had killed seven large fine Buf and your humble servant having the honor of murdering one, and so we spent our Sunday…19 miles distant comes a series of Bluff called Scotts Bluffs which has a most magnificent appearance; so we travel along road about 4 miles from the Bluffs it represents an ancient city. in the first place the Bottoms are covered with Blue Grass impregnated with a variety of flowers of rich perfume and beauty and then the sides of the hills are interspersed with Cedar trees which give the dingy and ragged Banks a splendid Contrast. My representation is faint in comparison to those beautiful Bluffs. on top of the highest peak-you can see very distinctly Laramie peaks of the Rocky Mountains distance 100 miles…"; couple small edge flaws and reinforced, Very Fine and early California trail letter. Henry A. Cox was one of the earliest emigrants in the first year of the Gold Rush.